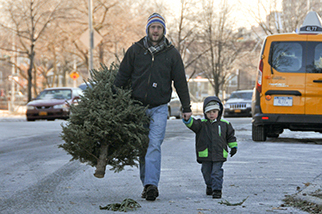 Yale Alumni joined Stanford Alumni in processing Christmas trees and wreaths into mulch for Prospect Park Brooklyn’s annual Mulchfest. The trees were fed into a chipper and the resulting mulch was distributed to public for use in their gardens or as a room freshener. The remainder was spread at the base of trees around the park to facilitate growth. The two organizations then went a local restaurant nearby, The Adirondack, for a social gathering from 2:00 to 4:00 PM.